Heat capacity of a substance is defined as the amount of heat required to rise of the temperature by one degree. 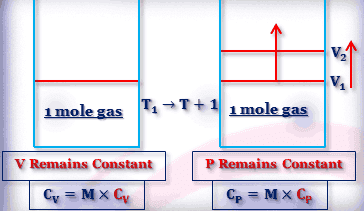 Heat capacity per gram of substance is called specific heat and per mole called molar heat capacity. Where CP and CV are the molar heat capacities at constant pressure and constant volume respectively. cp and cv are their specific heats. The specific heat at constant pressure and constant volume are 0.125 and 0.075 Cal gm⁻¹K⁻¹ respectively. Calculate the molecular weight and atomicity of the gas. Name the gas if possible. M = 40 and ⋎ = 1.66(mono-atomic), Ar(Argon). For gases, there are two heat capacities at constant volume and constant pressure. Thus for an ideal gas, PV = nRT; or, P(dV/dT)P = nR. Again, CP = CV+R for 1 mole ideal gas. Now let us find the expression of CV from the point of view of Kinetic Theory. CV = Energy required to increase transnational kinetic energy of 1 mole gas for rise of 1° temperature + energy required to increase inter molecular energy of 1 mole gas for rise temperature of 1°. Increase of transnational K.E. = (3/2)R(T+1) - (3/2)R = (3/2) R for 1 mole gas for 1° rise in temperature. CV = (dU/dT)v = (3/2)R and CP = (5/2)R.
Where N is the number of particles. For diatomic molecule N = 2. Thus CV = (3/2)R + R + R = (7/2)R and CP = (9/2)R.
For tri-atomic molecule N = 3. 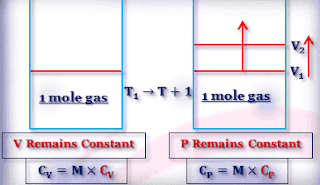 Heat Capacity of Gases and its molar heat capacity.